Over 1,500 travellers still stranded by mudslides in Peru's Machu Picchu area. They are safe but exchausted and frustrated by the living conditions in the temporary refuge site. Helicopters already took 600 tourists from the spot. Authorities said airlifts would continue throughout the week because more tourists had shown up at the evacuation site on foot after completing treks along the Inca trail to Machu Picchu, the 15th century Incan fortress 2,430 metres above sea level. Rain-fuelled mudslides on Sunday cut the train line that is the only transport link to the remote region atop an Andean mountain ridge. 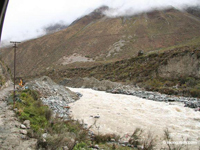 Adding to the worries, tourists flown out on Wednesday reported that a rain-swollen river had eroded the site where rescue helicopters are landing. Stranded tourists said they are being ripped off because food, water and accommodation are scarce in the now isolated Machu Picchu Pueblo, a village of 4,000 residents. "Everyone is safe, though obviously uncomfortable. They are sleeping in tents, and the food gets there late, but what's important is that they are safe," Foreign Minister Jose Antonio Garcia Belaunde said. Initially, some 2,000 tourists were reported stranded after train service stopped. Helicopters have ferried 1,070 people out of the village since Tuesday, including 595 on Wednesday, but Mr Garcia Belaunde said 1,500 to 1,600 tourists remained since more travellers trickled in each day. The new arrivals - 250 on Wednesday - reached Machu Picchu by foot on the popular Inca trail, which follows a stone path built by the ancient civilisation from their capital, Cuzco, to the mountaintop citadel. Authorities closed the trail on Tuesday after a mudslide killed an Argentinian trekker and her guide, but tourists already on the trail were still completing the four-day trek. People marooned in Machu Picchu Pueblo complained that restaurants were inflating their prices, and said many people had to sleep in the town's train station or in the central plaza after running out of money or the hostels filled up. "It's chaos. We don't have food, we don't have water, we don't have blankets, we can't communicate and the police lack an evacuation plan to put us at ease,"acording to an Argentinian tourist.